(Open Box) Pairs a Sitka top with beautiful solid African mahogany body for a well-balanced tone and sharp looks. With its comfortable body and distinctive voice, the M-140 provides excellent balance and a delicate tone. 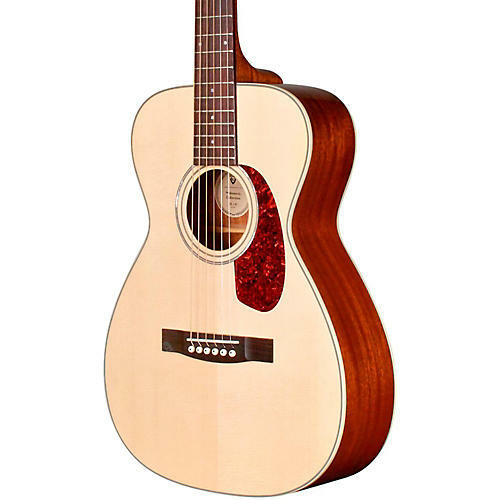 Built with a solid Sitka spruce top and solid African mahogany back and sides, the M-140' 24-¾ scale length and 1-¾ nut width on a vintage shaped Guild neck make this concert size guitar easy to play. The M-140 features an Indian rosewood fingerboard and bridge, NuBone nut and saddle, mother-of-pearl rosette, and period-correct tortoiseshell pickguard. This model also showcases Guild' iconic Chesterfield headstock emblem reminiscent of 1960s Guilds, and includes Guild' new lightweight polyfoam case. Available in Natural gloss finish. Order this gorgeous Guild today!